The RP Photonics Buyer's Guide contains 12 suppliers for Brewster plates. A Brewster plate is a plate of an optical material with coplanar surfaces, which is inserted into a polarized laser beam under Brewster's angle so that minimum reflection losses occur for p polarization. Figure 2 shows how the reflection losses of p-polarized and s-polarized light at each surface of the plate depend on the angle of incidence. Figure 1: A Brewster plate, inserted into a laser beam at Brewster's angle. The reflection loss becomes minimal for p-polarized light. Brewster plates are often inserted into laser resonators of bulk lasers, often with the purpose of introducing polarization-dependent losses. This can force the laser to emit light with a stable linear polarization, the direction of which corresponds to p polarization at the Brewster plate. In this state of operation, the losses caused by a Brewster plate can be very low, if the polarization state is not rotated or distorted by the other intracavity components. Depolarization within the resonator (e.g. caused by thermal effects in the gain medium) (→ thermal lensing) can couple some of the power into s polarization, which then experiences high reflection losses at the Brewster plate. Therefore, insertion of a Brewster plate can significantly decrease the laser efficiency even if the losses of the Brewster plate for p polarization are very small. The spatial shape of the reflected light can be complicated and reveal information on the depolarization mechanism. Figure 2: Fresnel reflectivity of a fused-silica surface at 1064 nm versus angle of incidence from air. 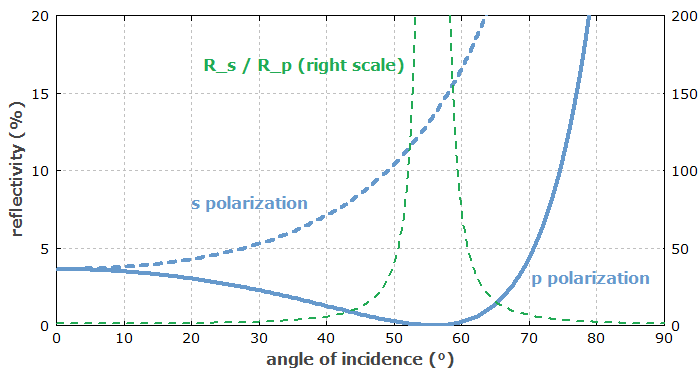 For p polarization, the reflectivity vanishes at the Brewster's angle of incidence (55.4°), whereas for s polarization the reflectivity increases monotonously with increasing incidence angle. 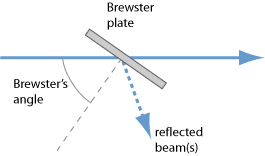 Note that the resulting reflection losses occur at both surfaces of a Brewster plate. Apart from polarization-dependent loss, a Brewster plate can exhibit thermal lensing when used in a high-power laser, and its nonlinearity and chromatic dispersion can be relevant in a mode-locked laser. Uncoated Brewster plates from N-BK7 or UV fused silica.